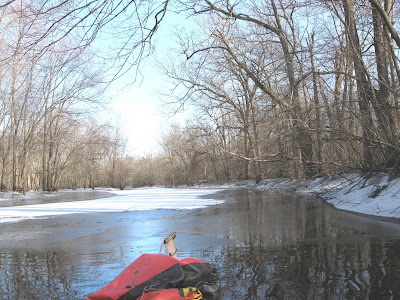 It sure felt good, late this morning, to get back 'into the flow' and trash patrol a wide open stretch of the Sudbury River in Framingham/Wayland. Trash was plentiful with the biggest portion recovered before I even reached the water at Little Farms Road. A large open trash bag containing the results of someone's party...113 empty beer cans and the cardboard packaging lay in the bushes at the launch area. Such thoughtfulness! Shortly thereafter my kayak and I were re-acquainted with the river, heading upstream, and all seemed well with the world. In fact, today felt more like very early spring than late winter. 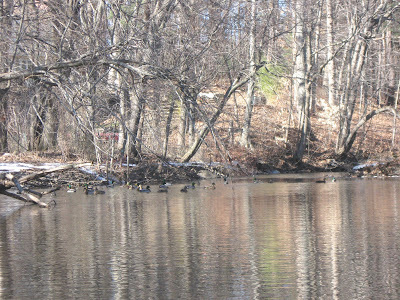 Saw a belted kingfisher and numerous ducks on the way upriver to Danforth St. where I turned around. Several wood ducks were also seen. I was surprised at how little ice there was along the sides of the river. Especially considering how it has been cold for so long. Most trash was easily released from Old Man Wnter's grip! Snagged plastic bags were abundant today. Just before the Power Lines I encountered the remains of an inflatable raft. Finding it to be beyond repair and full of water, it was decommissioned by my trusty knife. The total for the day was 204 pieces of trash. Of these 144 were recyclable (115 redeemable) and 60 were miscellaneous rubbish such as plastic bags, styrofoam, etc. My YTD total stands at 205. Were the Beothuk Early Trashpaddlers?